When you think of Hong Kong culture, visions pop into your head that involve the Buddah, parades with colorful dragons and Tai Chi. One thing you would never think of is horse racing. Chinese love to gamble but casinos are illegal though so the only thing they can legally gamble on is the horse races and a government run lotto. So when Wednesday night or Saturday afternoons come around, the Chinese go crazy with placing bets. 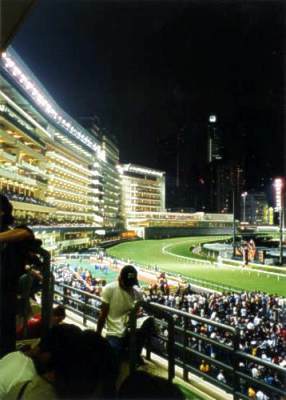 Because of their love of horse races (and gambling), the races are a huge part of the Chinese culture. And, of course, Troy forgot his camera so we had to steal this picture from another website. Wednesday night Troy and I were able to attend the horse races through the AWA. We paid $70 for the both of us and that got us into the horse races, dinner buffet and unlimited beer and wine! The restaurant was also on an outdoor terrace that overlooked the track so our view was amazing! Other then slow poke races with our home town rodeos, we have never really been to horse races. Seeing these magnificent animals and hear them ferociously gallop by was amazing. Troy tried his hand at betting. One race he won about $95HKD which is about $12USD and another race he won $2HKD which is equivalent to about 40cents US. Not even enough to buy us a pack of gum if we wanted.